>This past week I was able to interview Jessica Wilson. I was very happy to meet with her again after my first interview with her that was on camera. On a personal, none classroom side of things, I have been thrilled to get to know her better! This semester Jessica pledged Pi Phi here at Baylor and I am just a year older than her and I am also a Pi Phi. It has been a privilege to work with her in class as well as getting to see her at recent Pi Phi events. When Jessica and I met this week we decided to have our interview take place in Jones library. We were able to do the interview on each others cell phones by recording so we could replay the interview when we began writing. I had not used this technique before but I found it very helpful. I focused primarily on Jessica’s volunteer job as a Baylor Bruins girl. Her bubbly personality makes her ideal for any young athlete to meet. Jessica takes High School athletes around on Baylor football games and shows them a taste of what Baylor spirit feels like! Jessica sticks to her assigned athlete like glue at the games because there trip is for them to make a decision not so they can be swayed by others. I think Jessica is a great Bruins girl because she has the personality and characteristics anyone would love to see in a young women. She can relate to the parents with her well taught manners and can relate to the athletes because she is easy to talk to and I’m sure it helps that she is a beautiful girl! Being that Jessica is freshman the Sports Network Group, Baylor Bruins, should be thrilled that they will, if she so desires, have Jessica for the next three years. Perhaps our football stadium, fans, school colors and wonderful coaches aren’t the only thing that sway the minds of these eager High School athletes. 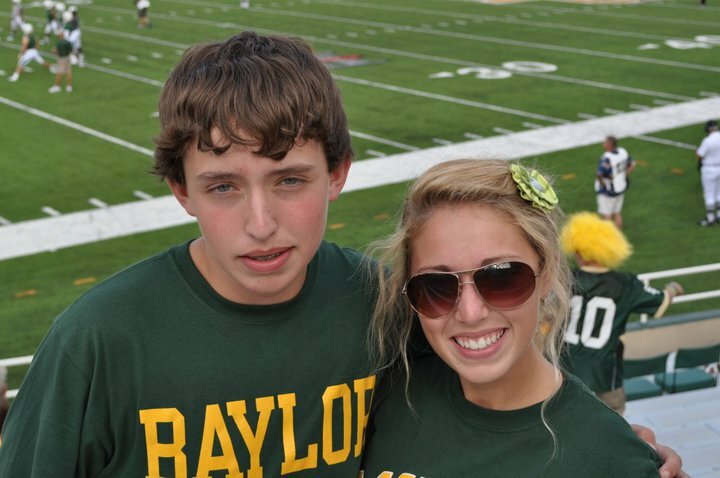 Jessica with her brother, Parker, cheering on the Baylor Bears!